Known as the “Atlantic” Portuguese pearl, Azores is an archipelago of 9 Portuguese islands, located 1400 km from Lisboa. Azores is a wonderful place with a high contrast of colors that enriches the view. The green of the mountains on their islands (top of biggest submarine mountains), the colorful flowers all over the island and the black volcanic sand of the beaches, a truly delight for the senses. Why choose when you can have everything? On the 9 islands of Azores you could find from: volcanic craters, vineyards, beaches, natural pools, tobacco and tea plantations, thermal waters, waterfalls, cliffs, valleys, watchers, among many other natural attractions. 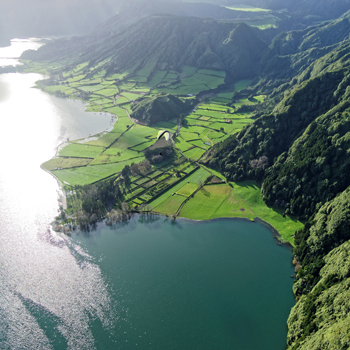 Azores is a sustainable destinations with many ecological touristic attractions that put a “magical” seal on this destination, and with an exquisite gastronomy makes this 9 islands in one of destinations growing in popularity worldwide among the international tourism. Either you need a small vehicle to travel on your adventures in Azores, or a minivan to go with the whole family, Economy Rent a Car offers an excellent fleet at the best prices.